New news has been posted, click here. The hotel has a main floor and three upper sleeping floors. We have a total of 53 rooms ranging from large parlor type rooms on the ground floor to small single bedded rooms on the top floor. The hotel was originally built without plumbing or electric and some rooms still do not have a bathroom, all rooms have a sink. There are two private baths on each floor for those rooms. 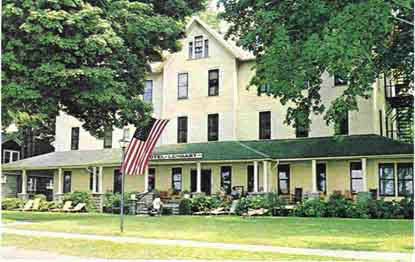 We operate during our regular season, Memorial Day to Labor day, and our rates include a full breakfast. Our dining room seats 125 persons. The cocktail lounge, The Lamplighter Room, is located just off the lobby. The music is usually Big Band which was the favorite of our long time bartender, Jimmy Anderson, who sadly passed away in the spring of 1996. The big feature of the Lenhart is the veranda that wraps from the side all across the front of the hotel. There are 40 of our famous multicolored rocking chairs for viewing the spectacular sunsets over Bemus Bay. Grab a chair early if you want a seat at sunset. Click here to e-mail for information: email Hotel Lenhart . Reservations and availability can only be obtained by phone or regular mail.